A quality frying pan is a kitchen essential which can be used in ways far beyond creating a simple fry-up. In your search for the best nonstick pan, you will come across a myriad of brands promising all sorts of kitchen miracles, but what should you believe and exactly what are the qualities to look for in a nonstick pan? We have checked out seven of the best, and take the guesswork out of your quest so that you can choose the right tool for your kitchen. If you’re looking for a complete set, check out our guide on the best nonstick cookware on the market. 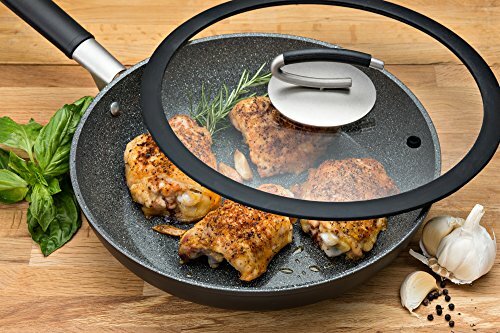 The Vesuvio frying pan has an aluminum core and utilizes a ceramic coating to provide non-stick properties without using any of the normal chemicals. The pan itself is light and fun to cook on. The lid is an especially tight fit, with silicone edges that make a perfect seal with the rim of the pan. Like most other nonstick pans, the handle is comfortable enough to use without a potholder. The entire assembly is oven safe up to 450 degrees. Although the manufacturer says it’s dishwasher safe, we still recommend you stick to gentle hand washing. While the nonstick ceramic used in this pan won’t chip like Teflon, it can get worn down by scratches, scrubbing, high heat, or even normal use over a multiple-year timespan. You’ll still need to be careful and avoid using metal utensils, aerosol sprays or cooking over a big flame. 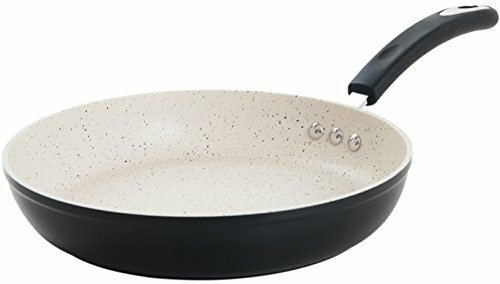 The Vesuvio ceramic coated frying pan is hardly unique as far as non-Teflon nonstick go. Nevertheless, the excellent fitting lid and one year warranty make it a standout choice for your kitchen. If you’re trying to avoid PTFE and other potentially harmful coatings, this may be a great way to do it. If you’re willing to forgive the use of traditional PTFE, this Calphalon omelet frying pan is nonstick and budget friendly. It comes with a glass lid to make cooking a bit more fun, although the “stay cool” stainless handle isn’t quite as heat-free as we’d like. There’s a unique handle on the front of the pan. We’re not quite sure what its intended purpose is, but it’s handy for hanging the pan handle-down or just carrying it around the kitchen while it’s hot. Finally, Calphalon offers a full lifetime warranty. It has plenty of caveats, but there’s still a lot of coverage for any problems you might have with your pan down the line. The Calphalon omelet frying pan has the same anodized aluminum core as most other non-stick pans on the market. As long as you’re okay with (PFOA-free) PFTE, it makes a great alternative to some of our more expensive picks while delivering similar performance. The All-Clad 4108 NS nonstick frying pan has a durable stainless steel exterior to hold up to the rigors of your kitchen and an aluminum core for fast, even heating. All-Clad has even included a disk of magnetic material to make it usable on induction cooktops. One of the more notable features of this pan is the slightly increased oven safe temperature of the non-stick material. Unlike most of our other picks, you’re free to throw this pan in the oven at temperatures of up to 500 F. This is about 50 degrees higher than the rest of the field. Are you familiar with Emeril Lagasse cookware? All-Clad’s PFOA-free blend isn’t going to disintegrate the first time you make eggs, but most non-stick coatings are quite fragile and often don’t last more than a couple of years. While All-Clad offers a robust warranty, the coverage of the non-stick coating itself is extremely limited. If you want confidence in your pan’s coating, try the Vesuvio above instead. 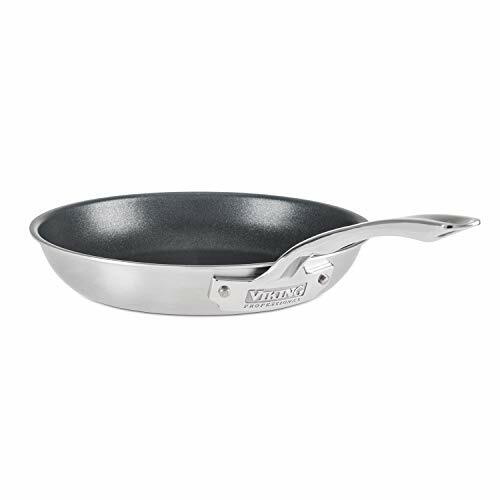 If you’re an All-Clad lover, the 4108 NS frying pan may be an excellent way to get your nonstick fix while supporting American manufacturing. With an aluminum core and stainless steel exterior, this versatile, professional quality pan can be used on all cooktops, including induction. It’s even safe for the grill. At this price-range, you would expect a high-quality product, and that’s exactly what the Viking Professional is. The nonstick coating holds up well with appropriate usage and maintenance. Follow the manufacturer’s instructions to season the pan before use. While this pan is a bit heavier than many, the heft reflects its sturdy and durable design. The handle does stay cool to touch, and the nonstick coating is easy to clean. As with other nonstick pans, you need to use a lower heat to cook your food – you can cook a fry-up on medium heat with no problems. The only niggle is that when empty, the weight of the handle can cause the pan to be unbalanced and tip slightly, but this resolves once food is added. If you have the budget to invest in a high quality, professional pan, then the Viking is a great pick. With the right pre-seasoning and care, you should be more than happy with its performance. However, at 2.65 pounds when empty, this pan is on the heavy side, so be prepared for a bit of a kitchen work out. These pans have a good weight to them but aren’t too heavy. The metal is thick and retains heat well. Food cooks evenly and the nonstick surface is durable. Although they are dishwasher safe, you really shouldn’t need to bother; they’re so easy to clean you just need a light wipe with a sponge in warm soapy water. 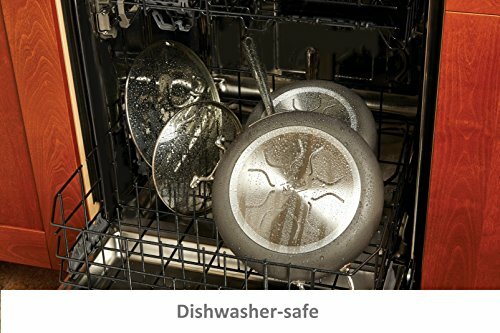 As with all nonstick pans, avoid machine washing to lengthen the life of the nonstick coating. The handles are uncomfortable to manage. Although they are nice and long, the slight curve at the side combined with their narrow girth can dig painfully into your hands. Overall, this is a good value purchase. For the lower price tag, the pans are sturdy, cook well, and the nonstick coating should have your eggs sliding around the pan. The only downside is the handle design, making maneuverability a little bit difficult and uncomfortable. The All-Clad frying pan set may be a great choice for a first-time chef or household on a budget, these pans should go the distance when maintained correctly. With an attractive and effective white speckled coating, this pan is a good-looking addition to your kitchen. At first glance, what seems to set this Ozeri pan apart is the STONEHENGE coating, free of any chemicals that other nonstick coatings may contain. The stone claims to be hardier and more scratch resistant than other standard coatings. What the manufacturer fails to mention is that the pan does actually still contain PTFE, only with some ceramic added into the mix. So, despite the lofty claims of being an innovative new kind of nonstick coating, it’s really just a Teflon pan with a bit of ceramic added. Having said this, it’s still a quality pan. The handle is comfortable and stays cool, and it gives a satisfactory nonstick performance, with even heating across the base. As with all Teflon pans, the coating will eventually degrade. How quickly will depend on how well you care for it. Wash it gently with a sponge and mild detergent, as instructed, don’t use metal utensils and cook on a medium heat at most. A nice touch is the inclusion of a felt insert that you should use for protection if you will be stacking the pans. 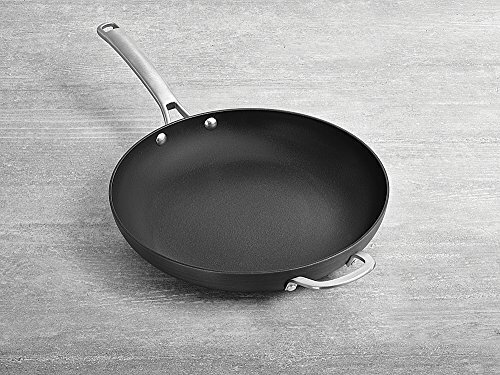 If you’re attracted to this pan because it is marketed as super-environmentally friendly and non-toxic, then you may be disappointed to discover it’s really just a variant of Teflon. However, although it’s nothing special, it still does a good job, as with other Teflon coated pans, just with a slightly higher price tag. This copper chef pan is unique on our list, firstly because of the square design, and secondly due to the copper construction. One of the best things about it is that it can fit more food at one time than the other circular pans. Also, unlike many of the other pans, this one comes with a glass lid. As with the other pans on this list, it heats quickly and works best with low or medium heat. This is one of the few truly PTFE-free pans, so a great choice for those consumers worried about toxicity or fumes. Although the ceramic nonstick coating can be effective, as with the others on this list, you really need to care for it appropriately to get the best out of it. See our Gotham Steel vs Copper Chef comparison to see how it stacks up with similar cookware. 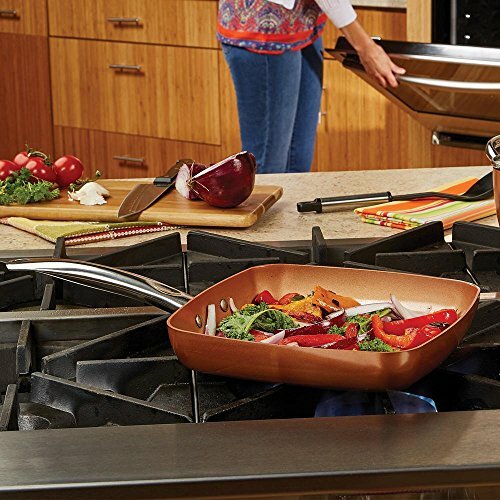 The major issue with this pan is that although the pan itself is square, the induction plate on the bottom is circular – this means food may not heat evenly if not in the center of the pan, particularly when used with an induction stove top. Although the hype around this pan looks promising, you do get what you pay for. This is not likely to be a high-quality piece of cookware that will last you many years, even with the most delicate handling. However, the Copper Chef square frying pan is a nice piece of cookware that is free of toxins, and for the money, well worth giving it a try. Le Creuset Reviews - Why It's Expensive & Is It Worth It?